A Solar charge controller is a major component of a solar power system. It regulates the voltage and current coming from a solar panel making sure it is within safe limit to charge the battery without overcharging or damaging it. You do not need to buy a charge controller if you have a solar inverter, because they come built-in. Solar Charge Controller price in Nigeria starts at around 7,000 Naira. Because the intensity of sunlight fluctuates throughout the day, the output voltage of a solar panel fluctuates as-well. In addition, because of this fluctuation, a solar panel is padded with more cells to compensate for times when the intensity of sunlight is low. For example, A solar panel rated 12V may actually be constructed with solar cells that will deliver 20V. This ensures that when there is low sunlight, the output of the solar panel will still be above its rated 12V. Since the primary job of a solar panel is to charge the battery, it creates a need for regulation of the voltage to make sure it does not get too high to damage the battery. This is essentially the job of a solar charge controller. The Solar charge controller takes in the fluctuating input from the solar panel and stabilise it to safely charge the inverter battery. Note that a solar inverter will come with a charge controller built-in. However, if you are using a regular inverter, you will have to buy the solar charge controller separately if you want to upgrade for solar power. So far I have told you that a solar charge controller regulates the charging of the inverter battery. However, depending on the quality it may offer a lot more. It protects your battery from high voltage and high current from the solar panel. It also offers short circuit protection. Some solar charge controllers will automatically detect the voltage of your battery (e.g. 12v or 24v) and will automatically regulate the voltage and current to suit the battery. It will also monitor battery temperature to prevent overheating. A Solar charge controller can also prevent reverse current. At night when there is no sunlight the voltage from the battery will higher than that of the solar panel this will cause current to flow back from the battery to the solar panel. A good solar charge controller will prevent this from happening. If your installation does not require AC voltage. A charge controller can supply DC voltage. In this very unique case, you will not need a power inverter. A power inverter is required when you need AC voltage. There are two types of solar charge controllers, the Pulse Width Modulation (PWM) solar charge controller and the Maximum Power Point Tracking (MPPT) solar charge controller. PWM charge controllers are simple and more affordable, but are less efficient. The PMW controller uses a series of pulses to charge the battery. It regulates the voltage by varying the width of the pulse. If it wants to increase the voltage it increases the pulse width and when it wants to lower the voltage it reduces the pulse width. The drawback of the PWM charge controllers is that they blindly regulate the voltage without compensating for the power output. For example, lets say you are using a 12V, 200W solar panel. During peak period, the Solar panel will have about 18V given the power rating of the panel the current will be around 11.11A. A PWM charge controller because of its design will reduce the voltage from 18V to 12V or 13V (safe for the battery) but will keep the current fairly constant at 11.11A. Since Power (P) = V (voltage) x I (current). The output of the PWM controller will be 133W (12V x 11.11A). This is a loss of about 66W from the 200W that the solar panel delivered. The problem is that a PWM solar charge controller shaves-off excess voltage and literally throws it away. An MPPT solar charge controller solves this problem because it works to keep the power fairly constant. Take the example I gave earlier, an MPPT controller will reduce the voltage from 18V to 12V, but will also try to keep the power stable at 200W. 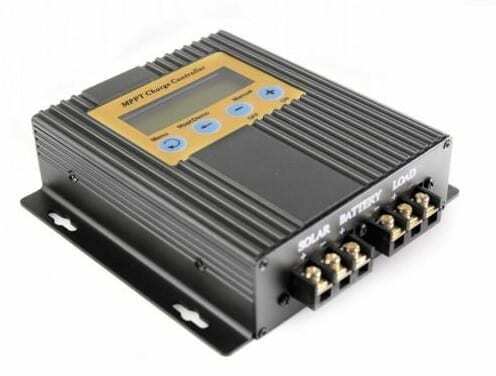 To achieve this an MPPT solar charge controller will increase the current from 11.11A to 16.66A (by reducing the load resistance it presents to the solar panel). This will then give around 200W (12V x 16.66A). So, essentially an MPPT charge controller shaves off excess voltage and converts it to current to compensate for the impact the reduction in voltage will have on power output. This is why despite being more expensive, an MPPT solar charge controller is a good investment for your solar energy system. However, if you are on a budget, a PWM charge controller will be okay. You can buy a solar charge controller from leading online stores in Nigeria or other leading retailers of power solutions in the Country. The price of a solar charge controller ranges from 7,000 Naira to 400,000 Naira depending on the technology and the rated power.